Then with just a few small adjustments, the following patterns will fit too! Fur Trimmed Jacket – Use Cabbage Patch pattern and make sleeves 1” (25mm) narrower, make armhole smaller and add ½” (12mm) to sleeve length. These alterations are just a guide and you may need to alter them slightly depending on the fit you like on your doll. So if you’re looking for patterns to suit your 17 inch (43cm) Baby Born Doll, then you can confidently use my doll clothes patterns as mentioned above. 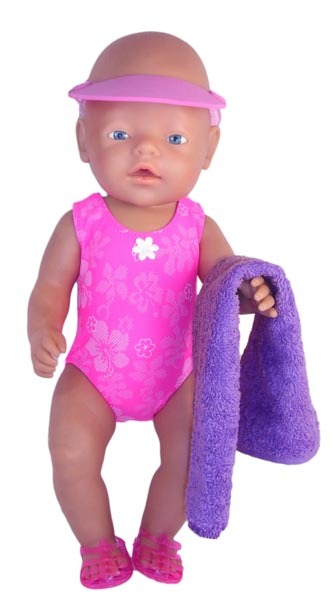 If you have a doll that is similar and want to compare her measurements to those of the Baby Born doll, you will find these measurements on the Doll Sizing Page. If, like Kitty, you are sewing for a different sized doll and using my patterns, please let me know which doll you are sewing for, how you go using my patterns and what adjustments you have made so I can share this information with others on my blog. Don’t forget to send me photos too, I love seeing what you have been busy creating! Thank you, I have been looking for doll clothes for my great grand daughter’s doll. She has a 16″ and an 18″ found clothes to knit for the 18″ thank you she will love these. This is going to make a nice little Christmas present and I love the jelly shoes. Awesome! Would love to see some photos if you get the chance to email them to me or share in my Facebook group.